Cumin is an essential condiment throughout Indian, which has a pungent flavor and rich in aroma. Cumin seeds considered as a seasoning ingredient and the ground cumin as a flavoring agent especially in the North Indian cooking. If you are following Indian recipes, you might have noticed that every long listed Indian recipe must be carrying cumin seeds. This shows how important in both North Indian and South Indian cooking. Cumin has a strong, bold flavor usually fried in oil and added to the food in the beginning or at the end of the recipe. There are many verities available in the market like Shahi jeera, black cumin, green cumin. But Shahi jeera and black cumin are the universal verities that is generally used in the Indian households. This is a good source of protein, dietary fiber, B vitamins with iron, magnesium, and manganese. This promotes digestion and improves blood cholesterol. And this is used in our traditional medicines for ages. And the modern studies also confirm this. South Indians make Rasam recipe, the Indian soup made with cumin seeds, and they prefer having this soup, after the heavy meal or at the time of indigestion. This soup is one of the must side dishes every day in Tamil cuisine. And surprisingly, South Indians primarily in the state of Kerala, the people have a habit of adding cumin seeds to the drinking water. I’m seeing some of your eyebrows are raising when you read about cumin in the drinking water. And yes, a teaspoon is added to a pot of water to soak overnight. The next day morning the whole bowl of water turns to light yellowish color and have a pungent, nutty flavor. The cumin infused water is believed to be good for throat infections and for regulating the digestions. Both these seeds are small, petite and usually confused with each other. These look-alikes have a very distinct and unique flavor. These are proportionally bigger than caraway seeds and has softer edges than caraway seeds. These are straight, and caraway seeds are curved at the ends. Though they appear similar, these are not the substitutes to each other. It is like comparing basil with mint. 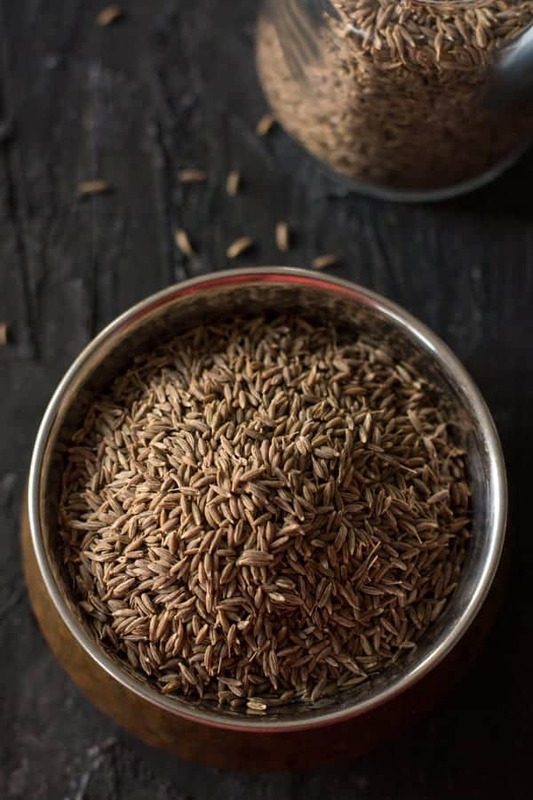 Cumin seeds are called as seeragam in Tamil, where it is pronouncing as jeeragam. In Telugu, it is known as Jeelakara. In Hindi, it is called jeera. These have a very distinctive, unique, intense flavor which is incomparable to any other ingredient. Fortunately, the cumin seeds are available nowadays in almost all the specialty stores here in the United States. So, I would recommend to use it not only for its flavor but also for its medicinal and nutritional values. Cumin seeds are used as whole or in the powder form. Cumin powder or the ground cumin is used as the final touch. Just before serving the dish the ground cumin will be sprinkled over to enhance the aroma and taste of the meal. While ground cumin is available in the market, you can also make your won, dry roasting and grinding it in the spice jar. If we are using it as a whole seed, add few drops of oil in a pan and the cumin seeds. Allow it to crackle, and this takes just a few minutes. It should turn golden brown, always keep in medium flame to control the cooking. The burnt cumin spoils the flavor of the food. So, need to be cautious while frying them. Just half a teaspoon of cumin is strong enough for the dish two people’s serving size. Always stick to the recipe which calls for cumin seeds.